Evian, the brand that doesn’t stop to motivate people to live young and awaken their sense of wonder, and is also the official water at 2012 Wimbledon Tennis tournament, will give fans the chance to win Wimbledon tickets while hunting for a pink tennis ball. The competition will start tomorrow, on June 22 and Evian will give away a pair of VIP tickets every day of the initiative. Fans can find clues on Evian Twitter and Facebook page and the Evian ‘ball boy’ will interact with fans offering users to ‘check in’ at the required location to stand a chance of winning, says Drink Brands. Laura Pope, Brand Manager for Evian commented: “The Evian Ball Hunt is just one part of our summer campaign to bring the Evian Live young spirit and Wimbledon partnership to life. 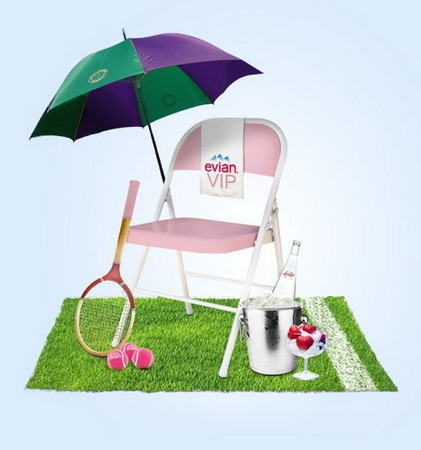 She added that Evian will also launch a Live young experience for tennis fans in the Wimbledon ticket queue as well as the Evian Café and VIP Live young Suite inside the grounds.